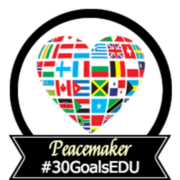 Have your students join a global project or start a project to spread peace. Students can also create and spread messages of peace through social media via a graphic, digital poster, or video. Try digital poster or graphic tools to create your projects.